Reflexology is a science, a powerful holistic therapy that deals with the principles that there are reflex areas in the feet and hands, which correspond to all of glands organs and part of the body. Stimulating these reflexes properly can help many health problems in a natural way, a type of preventative maintenance. Reflexology is a complementary therapy and can help to relax and calm, balance the body, improving nerve and blood supply. This gentle therapy encourages the body to work naturally to restore its own healthy balance. 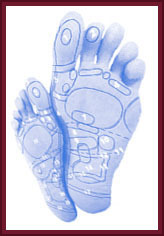 Reflexology brings balance and harmony to all body systems. It can calm or stimulate according to the needs of the body. Indian head massage is based on ancient Ayurvedic healing techniques. There are a range of different movements used including application of deep kneading and compression movements over the neck, shoulder and scalp areas. In addition, the therapist also gently stimulate and stroke pressure points on the face. Reiki healing can be given anywhere at any time as no special equipment is needed. The practitioner is a channel which the energy is drawn through by the need or imbalance in the recipient.